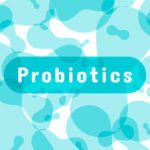 Probiotics may be the most important supplement of all. Every one of my cardiology patients MUST take them. Their success (and mine) depends on it. Probiotics literally means “pro-life” and antibiotic means “anti-life”. Doctors use the term probiotic to encompass the trillions of bacteria (flora) and beneficial yeast that colonize our intestines. The gastrointestinal (GI) tract has a delicate balance of beneficial and harmful microbes doing the dance every day. When this coexistence gets out of whack in favor of the bad guys, disease will flourish. Poor nutrition from grain (especially gluten containing grains), dairy, and sugar wreak havoc on the gut and can allow the bad bacteria and fungi to flourish. Antibiotics, steroids, fluoride, and chlorine inflict major GI damage. Bacteria in the mouth convert plant-based nitrates to nitric oxide, the body’s main vasodilator. 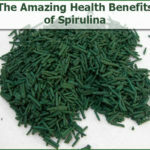 Read more about boosting nitric oxide here. Also, genetically modified foods will surely alter our GI flora as the FrankenDNA from GMO will change the DNA of healthy gut flora. Another nasty player is the pesticide Round-Up. The active ingredient glyphosate damages gut bacteria and causes a leaky gut. If you do not have proper digestion with adequate amounts of stomach acid and digestive enzymes, disease will begin. Our ancestors ate bacteria in the dirt every day. They didn’t pull a carrot and scrub it clean. You can imagine Paleo people had very dirty hands, which would actually boost the immune system. 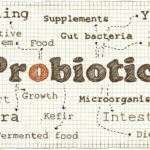 The health benefits of probiotics have been recognized for thousand of years. Our ancestors may not have known about the tiny bacteria themselves, but they knew the healing properties of fermented foods such as sauerkraut, kimchi, kefir, and yogurt. One bite of these items has billions of good bacteria and I recommend eating kraut or kimchi weekly. Kombucha tea would also be an excellent source of probiotics and is great for an afternoon pick-up. Dairy is best left for the baby cows. WHY DOES A CARDIOLOGIST CARE ABOUT THIS ISSUE? Well, cardiovascular disease is linked to inflammation and a major source of inflammation is the gut. Heal the gut and heal the heart. The good news is, probiotics are proven to heal the leaky gut. 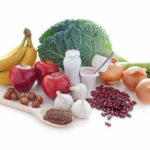 Hundreds of studies confirm the benefits of probiotics on cholesterol levels. 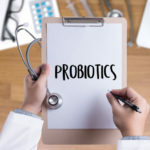 A study in the European Journal of Clinical Nutrition found those patients randomized to probiotics vs. placebo increased there HDL from 50 to 62. Probiotics reduce blood pressure according to numerous studies and my clinical experience. Probiotics improve blood sugar. The lower the blood sugar, the lower the risk of heart disease. 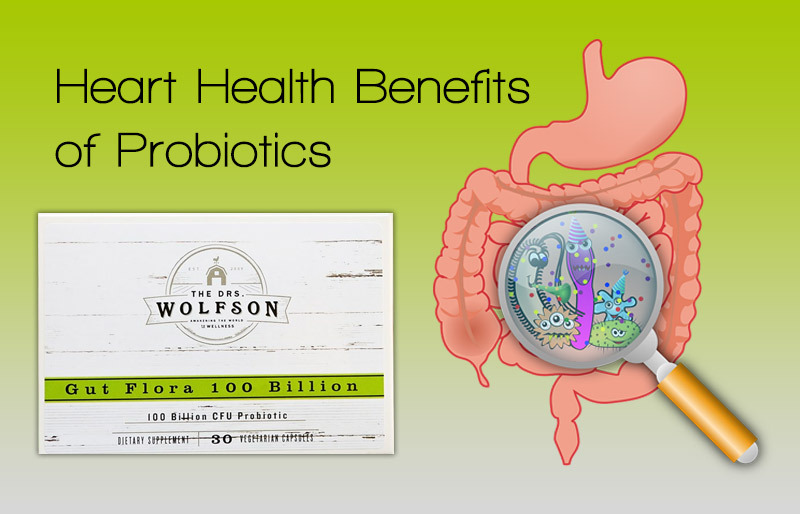 Probiotics lower inflammation and improve heart function! PROBIOTICS are best consumed on an empty stomach so I recommend dosing when you first wake up and 30 minutes before dinner or even at bedtime. It is good to take a variety of probiotics as there are hundreds of different strains that make up a healthy gastrointestinal tract. Overdosing is very unlikely, if not impossible. Side effects are mostly limited to loose stools. When our ancestors wanted a carrot, they would pull one out of the ground and eat. In present day, our store bought vegetables are washed before we buy them and then scrubbed at home to get off any remnants of dirt. I am not opposed to the cleaning of our food due to toxic soil, air, and water, but this is all the more reason to consume probiotics on a daily basis. In addition, our hands used to be dirty from the soil and our hunter-gatherer lives. Not any longer, you can’t walk five feet without running into hand sanitizer which effectively removes all good probiotics along with giving you an extra dose of chemicals. Could the diseases afflicting our children and the recurrent infections we all seem to get be due to our sterilized society? For more information, check out our Gut Flora 100 Billion and Gut Flora 30 Billion.